An Arizona electric cooperative that serves more than 33,000 customers is helping prove the value and potential of unmanned aerial systems (UAS) in enhancing the utility’s geospatial information system (GIS) effort. Using an Intel Falcon 8+ Drone — Topcon Edition, UAS specialist Skynetwest is performing missions to illustrate the viability of UAS technology. Initial work for the Navopache Electric Cooperative (NEC) included inspection of a substation, conducted on a windy day that might have grounded traditional aircraft. Windspeed limits for the Falcon 8+ in GPS mode are set at 26 mph; in height mode that threshold is extended to windspeeds as high as 35 mph. 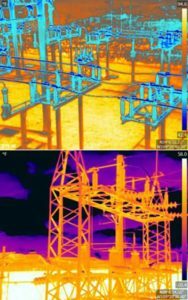 Using ContextCapture and Agisoft PhotoScan software, Skynetwest created a detailed georeferenced 3D model of the substation. The Falcon 8+ also has triple-redundancy inertial measurement units (IMUs), double redundant compasses, dual-constellation GPS, eight propellers and two batteries. An algorithm selects the most accurate of the redundant systems to use when the UAS is flying near the electromagnetic frequencies emitted by power lines. The team easily switched between a camera payload for inspections and one for mapping. Skynetwest’s mapping package takes high-resolution geo-referenced aerial images from various heights within set GPS tolerances. Its RGB camera delivers both orthophotos and 3D models in Topcon ContextCapture software, powered by Bentley Systems.